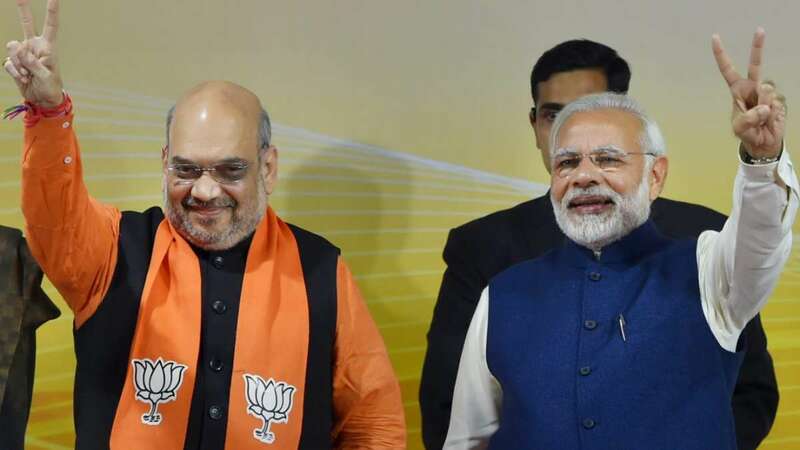 New Delhi : Prime Minister Narendra Modi along with BJP President Amit Shah today released the party's election manifesto 2019. During the release, Union Home Minister Rajnath Singh mentioned that the manifesto is BJP's Sankalp Patra, a vision document for 130 crore Indians. 2) Under Kisan Samman Nidhi, Rs 6000 will be given to all farmers and small traders will be given pension after 60 years of age. 7) BJP manifesto promises to continue with the simplification of GST process by engaging in dialogue with all stakeholders. 9) Promises to make India the third largest economy of the world by 2030. This implies that BJP is committed to make India a US $ 5 trillion economy by 2025 and US $ 10 trillion economy by 2032. 11) Manifesto promises to explore all possibilities within the framework of the Constitution and all necessities to facilitate the expeditious construction of the Ram Temple in Ayodhya. 12) Promises to undertake every effort to ensure that the subject of faith, tradition and worship rituals related to Sabarimala presented in a comprehensive manner before the Hon’ble Supreme Court. 13) Commitment to complete the National Register of Citizens process in these areas on priority. 14) Resolve to realize Mahatma Gandhi's vision of Gram Swaraj, a sankalp to facilitate Saashray(housing), Sujal(drinking water),Suchna se sashaktikaran(digital connectivity through Bharatnet), Sadak se samriddhi(road connectivity), Swach Bharat vision. 15)Commitment to make 33% women reservation in parliament and state assemblies through a constitutional amendment. 17) 1.5 lakh health and welfare centre will be opened, along with 75 medical colleges and PG medical colleges. Will target provisioning of telemedicine and diagnostic laboratory facilities at Health and Wellness Centres by 2022. 18) BJP reiterates its position since the time of the Jan Sangh to the abrogation of Article 370. Also stands committed to annulling Article 35A of the Constitution, which it says is discriminatory against non-permanent residents and women of Jammu and Kashmir. 20) BJP commits to bring transgenders to the mainstream through adequate socio-economic and policy initiatives, adding that it will ensure self-employment and skill development avenues for transgender youth. 21) BJP reiterates its commitment to "protect the linguistic, cultural and social identity of the people of North-East."